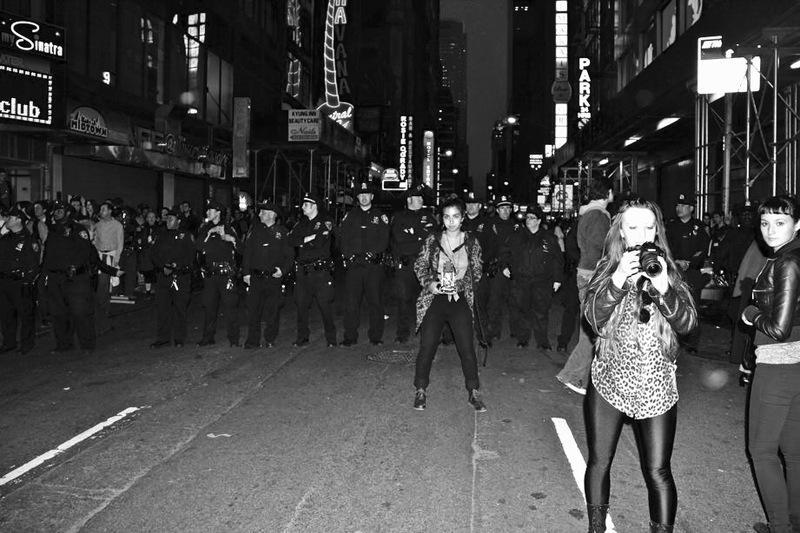 Black and white with bright lights of mayhem on a Saturday night in NYC when girls on a night out get caught in the fun of the NYPD holding back the protesting crowd at nearby Times Square. What’s not to love about girls prepared for action – leather, denim, leopard spots, hair, attitude and cameras! The NYPD and Dunkin’ Donuts are famous partners Martin, well spotted, and yes I think the girl is using a TLR – wouldn’t you just love to see her shots! Honestly though with all the talk about the best cameras for street work etc I have seen just about every camera known to man out on the NYC streets. In both calm and very rough times! Oh man, this is terrific! Hey John, thank you so very much! Leather, action, and leopard spots, along with one swanky “Sinatra Club” sign. I agree. Brilliant, Patti! Thank you Theadora, they owned that part of the night! This is brilliant, Patti! Congrats. This is still a wonderful study in street photography. So simple, so perfect! So very grateful for your kind words Stefan, thank you so much! be not afraid, takes guts, and do they have guts ! wow ! A good mantra to have, thank you kindly Fernan! A terrific contrast between the women- staggered and standing strong, and the police-in a row and looking a little bemused. Always good to be prepared, thank you Lignum! The second from the left; is that one policeman or are there two? Awesome Patti. They look so intimidating I went straight back under the doona. You have a powerful strobe. The light falloff doesn’t seem to really have an impact until about 30′ from where you are. I think I might have been hitching a light there somewhere Allan! That’s a tough call between the one or two NYPD Gerard, you can come out now! It’s a shutterbug standoff between Patti and the Jersey Girls in NYC! Rolled-up Pant Cuff Chick is looking pretty formidable in her stance while she has uniformed reinforcements at her back. My money’s on Patti though! PK’s got skills! Allan, you say the nicest things! Awesome moment! Perfect timing, perfect moment, awesome street photography, Patti, well done! That’s s good to hear thank you Indah! My thanks to you Rabirius. You know what I love about this shot? That the crowd is facing you! I can just picture you capturing this, seeing what you want to shoot, boldly going in, and nailing it 🙂 I remain in awe of your mad street photography skills!! Thank you ever so much Stacy! Most of the action was happening on the other side but I always find it interesting to turn around now and then to see what’s happening behind me which, in this shot, is now in front of me. My favourite WP photo of the year.. Overcome with your kindness Peter and thank you, thank you! You always get to the heart of it, Patti! You are so kind and always lovely hearing from you, thank you Annie! Nothing like a good protest to bring the gear out. As for photos of me . . . . . not looking for them that’s for sure! such a brilliant social documentary… it will not be the same without the leopard print lol… such a fabulous capture!! Thank you Alexandra, Saturday night out on the town with a protest thrown in for added excitement! What was the demo about, PK? Hello Pete, how are you? This was in the early heady days of Occupy Wall Street . . . .
What an exciting image, Patti. A real contrast of emotions. Very NY…love it and the fact that you stood right in the midst and captured it all. Brava! So many mixed emotions Jane – this was a Saturday night, so much happening, and someone was waiting for me to come home and cook dinner! Yes Lyn, that does make sense but . . . . boy, have I seen them lose it in a hurry. Over the years spent taking photos in the city – protests, demonstrations, parades, you name it, you get to see the same familiar faces amongst the NYPD who handle this sort of thing. I know many of the OWS were conflicted with their feelings towards the NYPD as many of them had cops in the family etc, with a mix of good and bad memories. I will never forget having my phone grabbed out of my hand by one of the NYPD scramming at me behind his riot gear nor the time one of the leading white shirts turned on a protest and grabbed, right in front of me, a young black boy around the neck. He was one scary guy, straight out of central casting. Brilliant again Patti! I would likely have been cowering behind the cops!